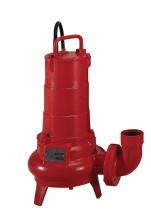 This submersible electropumps are available with support feet or stand for portable installation and connection foot for fixed installation. Depending on the model, the F series pumps, may have delivery port threads, Gas engine oil bath or dry chamber, double mechanical seal, stainless steel shaft and built-in protection against overheating. 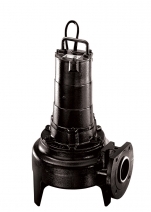 The F-series submersible electropumps are available with single-channel open impeller and with free passage from 30-40-50-60-65-75-80-100 mm. Submersible electric pumps suitable for pumping screened wastewater, draining the sewage of blocks of flats and houses and flooded premises in general. Submersible electric pumps particularly suitable for pumping industrial sewage, screened wastewater and mud in the pumping stations. They can be used also to lift clear and dirty water and rainwater.